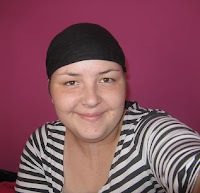 Kicking Cancer's Arse: 26 ~ The one where Hayley went to the Hospital...again. 26 ~ The one where Hayley went to the Hospital...again. I've run out of quotes to use!! I'll try to make this quick because I have to go out in a minute. But, knowing me it will end up really long anyway! I had my monthly check up today, I had to wait a bit longer than I usually do but I'm not bothered. Mr Pace asked how I was and I said I'd been feeling really tired and I wanted to know if I could have a blood test to check my thyroid because apparently it can be affected when having radiotherapy. So he gave me a blood test form and I went to go and get it today but it literally closed 2 minutes before we got there, annoying!! So, I'll go tomorrow morning. I also asked when my scan will be and he said he doesn't know but he'll contact me via the post once he finds out. Then he felt my neck, he said it felt fine. He confirmed that my double chin is lymph fluid (which is common) and that it should go away eventually. I can't wait! Then I went over to have the camera done, he looked down there and said "It looks really good" and said that he was please. Mr Pace is a man of very few words! That was pretty much all that happened, the computers were down so I don't know when my next appointment is but I'll get a letter in the post. Mr Pace said if there's any problems with my blood then he'll let me know. He's going to speak to my speech therapist, Hilary and tell her what's going on there down there, I have an appointment on the 10th with her. He did notice that my voice has improved a lot since I last saw him. Hmm...I've forgotten what else I was going to say. 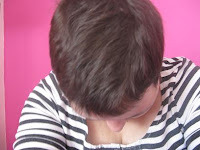 Oh, two pictures for you...one of my hair and one of my neck. My hair looks darker in person, enough of the thickness...more of the length please!! One last thing - everybody in the UK - Buy Love it! magazine on Tuesday the 8th July. I'm in it, eek!! The hair looks great! Send some of that thickness my way! Your hair is much darker than in the pic...and i noticed today that you had curls lol....its lovely to see your hair growing back thick and fast (but I know you want it growing back FASTER)...it wont be long till you go for that new style! Fantastic news also from Mr P-B...fingers crossed for the blood test!! Hey Hay, wow your hair is looking fab matey I am so pleased. It is longer than mine! Well, I shave it again last night! (not bald, a number 2). Thank you for sending me your text last week, appreciate it so much, got weigh-laid and forgot to reply, sorry! Hope you are enjoying your Wii, I got boom blox from my sister for my birthday, great fun! Wow Hayley - things are moving on at a great pace for you!! I think I'm registering for the Mouth Cancer Walk - just checking to see if my kids are going to join me - so you never know we may well meet up very soon! !